Have fun out on the road, driveway or elsewhere with the 1/10th Scale Monster Truck. It features an aluminum chassis, as well as a colorful, eye-catching design. The brushless motor is powered by an included 7.2V 2000 mAh LIPO 15C battery. This remote control monster truck has four-wheel drive and is suitable for indoor and outdoor, as well as off-road use. It also features a high torque servo, chrome wheel rims and full aluminum shocks for reliable performance. 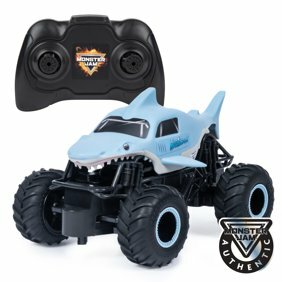 Included with the electric powered off road monster truck is a remote control using a 2CH 2.4Gh transmitter for rapid response to commands. It is recommended for ages 8 and up and provides a fun activity for children and adults alike.